Felix Hüttel, born in 1999, started playing the horn at the age of eight. 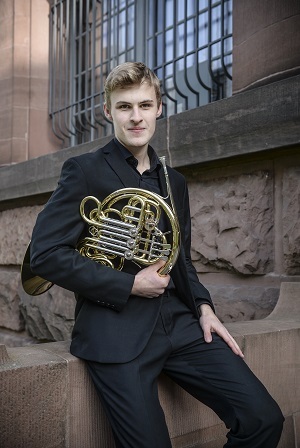 He is currently studying at the Stuttgart University of Music and Performing Arts in the horn class of Prof. Christian Lampert. He was awarded with several first prizes in competitions like Karel Kunc Competition or Jugend musiziert, also priced with the Bruno Hermann Award by Pfälzische Musikgesellschaft and the Hans Sikorski Award by Deutsche Stiftung Musikleben. He is furthermore supported by several foundations, like Zukunftsinitiative Rheinland-Pfalz, Villa musica or Deutsche Stiftung Musikleben. The young musician got important musical influences by Esa Tapani, Fergus McWilliam and Raimund Zell. He is especially interested in chamber music. He received experiences by playing with piano as well as being part of a several brass and wind ensembles. He completed his facilities by doing masterclasses like Deutscher Kammermusikkurs or Epoche f with Ensemble Modern. Actually Felix plays in the National Youth Orchestra of Germany. There he worked with conductors like Karl-Heinz Steffens, Sebastian Weigle or Sir Simon Rattle. Concert tours brought him to France, Italy, Romania, the Baltic States, India and China. In October 2017 he is looking forward to start his bachelor studies at Bruckner University Linz. If you are interested in working with Felix, please get in touch with the EMCY Office.